It might be a little sick, but humans love to watch other humans perform death-defying feats. There's always that slim chance that the daredevils will fail and plummet to a gruesome death. But that's not what we really want. We want them to succeed, to perform a trick so awesome that we can't believe they didn't die doing it. That's the feeling viewers get when they see the Shangri-La Chinese Acrobats perform. 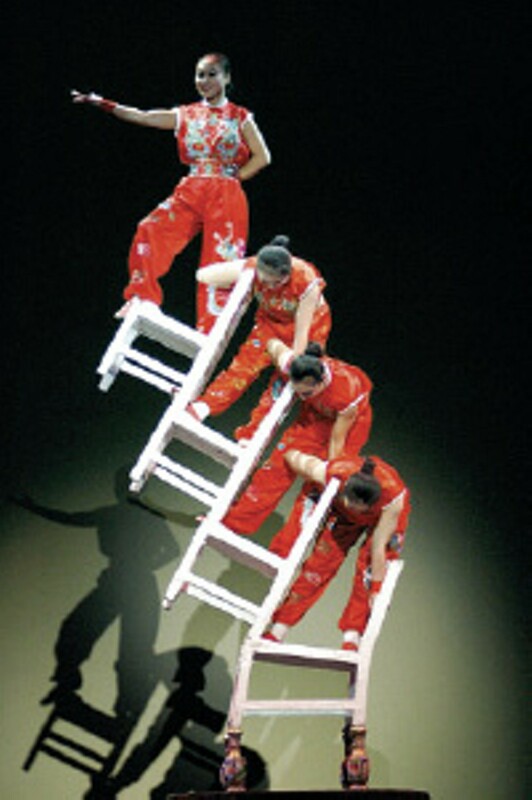 Whether they're jumping through fiery, knife-lined hoops or balancing on a tower of chairs stacked to the ceiling, this professional acrobatic troupe never fails. That's probably due to the life-long training Shangri-La acrobats must go through. Most members are born into the group. Having watched their parents perform from an early age, young acrobats begin formal lessons for four hours a day by age 5. The result is an action-packed show with balancing feats, martial-arts displays, juggling, and tumbling that's sure to wow audiences. 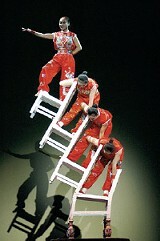 Shangri-La Chinese Acrobats, Saturday, October 20th, 2 and 7 p.m., Buckman Performing and Fine Arts Center. $20 adults/$18 seniors and students (537-1483).